Click here to take the IRA Survey! 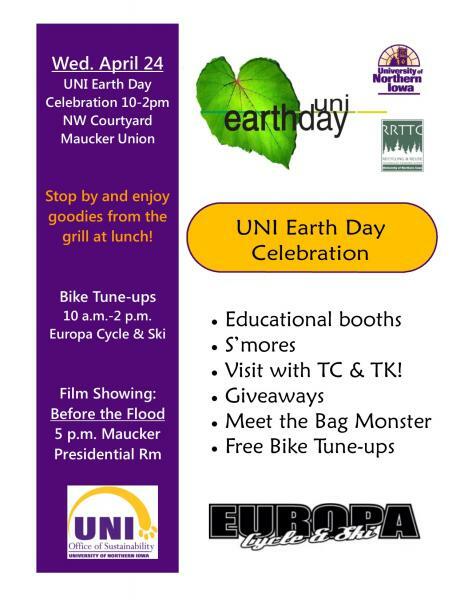 The UNI Earth Day Celebration is here! Come join us at the NW Courtyard of Maucker Union on Wednesday, April 24th, from 10-2 pm. There will be lunch served from the grill, educational booths, free bike tune-ups, s'mores and more! Join Dr. Leigh Zeitz on February 27th to learn about the Sustainable Development Goals set by the UN. Come to ROD Library 287 from 3:15 to 4:15 to explore how these goals have been implemented into lesson plans and classroom projects. Light refreshments will be served! RRTTC serves as a research, education and outreach center for the development of economical approaches to solving intractable solid waste problems, providing research and technical assistance on public health concerns as they relate to solid waste concerns.